A Dry Fast Core offers protection against unexpected leaks. 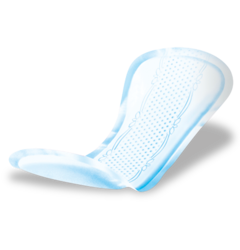 TENA Liners and Pads have Fresh Odour Control. Micro-fresh pearl design reduces growth of ammonia producing bacteria, which in turn reduces odour. This product offers discretion while providing comfort and dignity. All TENA Pads products offer the individual Triple Protection from leaks, odour and moisture. Helping the user to stay dry, secure and confident at all times, both day and night. Individually wrapped products provide convenient, discreet portability. 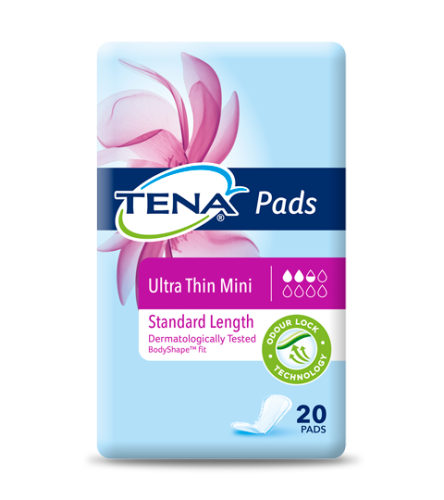 TENA Pads has soft, breathable material that allows air to circulate and promotes healthy skin. The product's breathability improves user comfort and keeps the individual feeling dry and fresh.